Gisele Bundchen graces the July 2018 cover of Vogue US. Photographed by Inez & Vinoodh, the supermodel and environmentalist wears a printed maxi dress from Ralph Lauren. 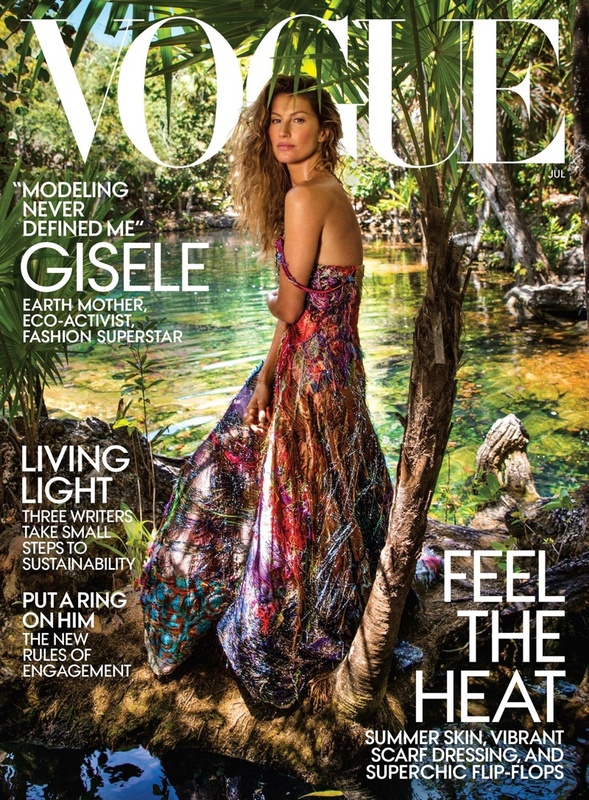 Inside the fashion glossy, Gisele poses on location in Tulum, Mexico, wearing bohemian luxe styles. Fashion editor Tonne Goodman dresses the blonde in the designs of Dior, Edun, Alexander McQueen and more. Actress Nicole Kidman looks red hot on the Fall-Winter 2017 cover of LOVE Magazine. Photographed by Carin Backoff, the Australian beauty wears a Love Stories Swim Club swimsuit with a Stetson hat, Pinko denim jacket and Frye boots. Posing in Nashville, Tennesse, Nicole showcases her inner cowgirl in the fashion spread. Talking about the shoot, the 50-year-old says, “That’s crazy what we did. Little denim shorts, right? I thought about that afterwards. I was like, what was I doing? I lost my mind!” Stylist Sally Lyndley dresses Nicole in casual styles including denim, t-shirts and even chaps. After appearing in Vera Wang's most recent Bridal campaign, Mariacarla Boscono is back as the face of the American designer's fall-winter 2017 advertisements. Photographer Patrick Demarchelier captures the Italian model in black and white images. The new season spotlights dreamy dresses, boxy outerwear and sleek eyewear. The shoot was styled by Panos Yiapanis with creative direction by Pascal Dangin. 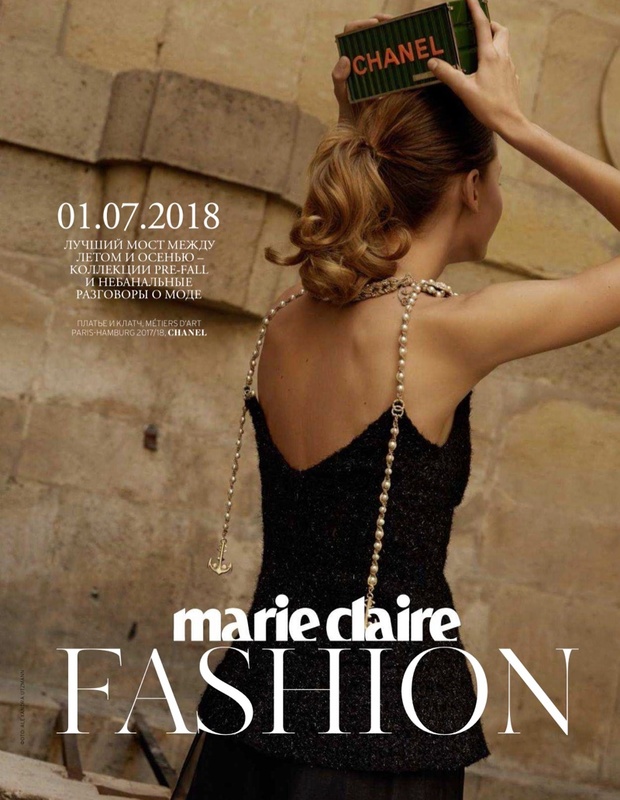 Fashion photography is ushering in a new era with fresh names. Photos (left to right): Harley Weir for Calvin Klein, Zoe Ghertner for Hermes, Jamie Hawkesworth for Alexander McQueen, Gregory Harris for Versus Versace and Theo Wenner for Chloe. In the world of fashion, one of the most important roles goes to the photographer. The image makers can help make models stars, cement the image of a brand or even inspire aspiring photographers. We are all familiar with well-established names like Steven Meisel, Mert & Marcus and Mario Testino. And throughout the past several years, fashion has introduced new rising names to the field. Here, we talk about the photographers of today including Harley Weir, Jamie Hawkesworth, Theo Wenner, Zoe Ghertner and Gregory Harris. Raised in the United Kingdom, Harley Weir became known for her unique, seemingly candid style. Part of the new guard of female fashion photographers, she does not shy away from eroticism as shown by her controversial Calvin Klein campaign. With a BA in Fine Art from Central St Martins College of Art and Design, Weir is self-taught. The photographer shot to massive success after shooting Calvin Klein’s spring-summer 2016 campaign. Soon afterwards, she would shoot advertisements for brands such as Balenciaga, Stella McCartney and Missoni. In a 2016 interview with i-D, she says this about the legacy she hopes to leave with her work. “I’d like to be a part of a time when women are free from suppressing laws and ridiculous traditions.” Weir also photographed covers of magazines such as POP, Self Service and most recently--Vogue Italia. Another rising star in fashion photography is British lensman Jamie Hawkesworth. He previously worked as Alasdair McLellan’s assistant photographer. A style of documentary-inspired images, frequently shot on film, landed him campaigns for brands such as Miu Miu, Loewe, Alexander McQueen and J.W. Anderson. In an interview with i-D, the photographer says about his profession, “Just being a photographer — that commitment to time spent taking photographs, because that's what it is. To me, it's not a set up, conceptual act; it's spending time by yourself with your camera taking photographs.” Hawkesworth’s work can also be seen in magazines like W Magazine, LOVE, Vogue Paris and Vogue US. Australian fashion brand Zimmermann channels seventies, rock and roll vibes with the launch of its fall-winter 2017 campaign. Starring model Vanessa Moody, the images take place in an empty auditorium. Photographer Benny Horne captures the American model in bohemian inspired looks ranging from ruffled dresses to breezy tunics and suit separates. 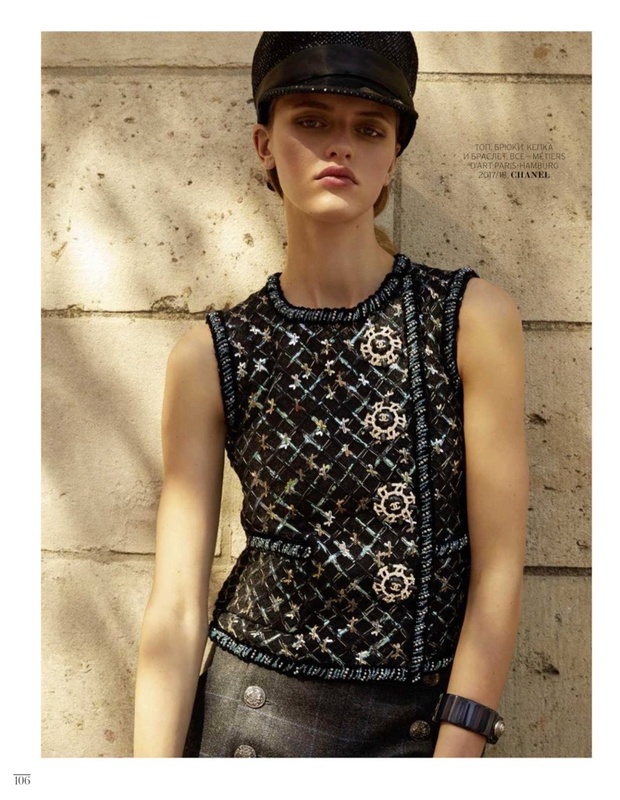 Caterina Scardinio worked as stylist for the shoot with Jodie Boland on makeup and Jordan M on hair. Discover more images from Zimmermann's fall campaign below!